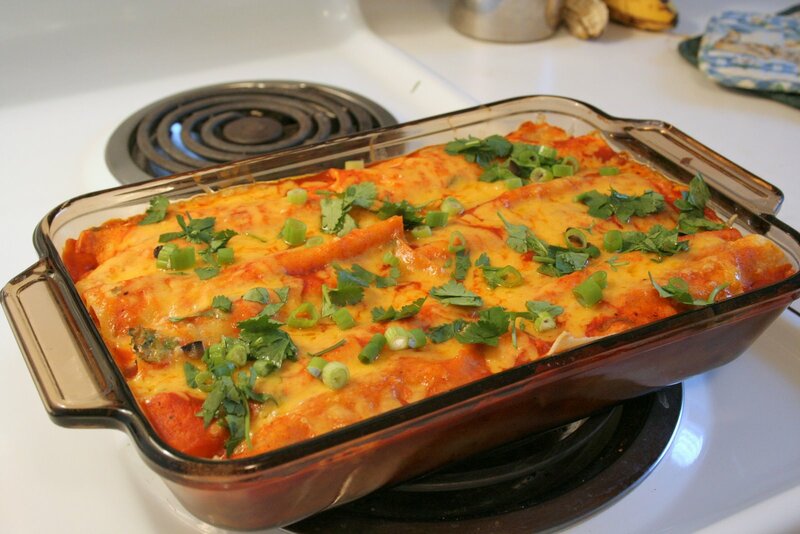 I've been eyeing this recipe of Pioneer Woman's for quite a while, but it looked rather intimidating because of all the steps. I went ahead and did it anyway but I got short on time and had to do some shortcuts. 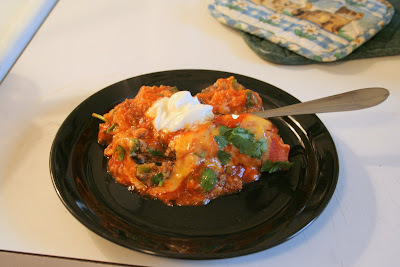 (If I don't serve dinner on TIME the men around here get really CRANKY) :-) So if you want to see how she does it, I put a link there for you to go to her site, but I'll post her recipe here and tell you what I did. 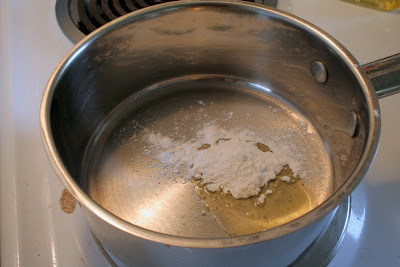 In a large saucepan over medium heat, add oil and flour and whisk together to make a past, cooking for 1 minute. 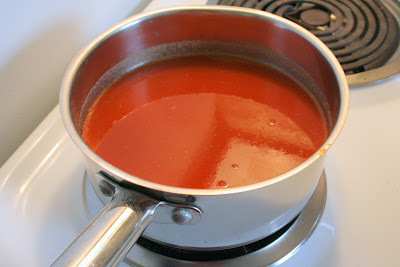 Pour in other red sauce, chicken broth, salt, and pepper, and bring to a boil. 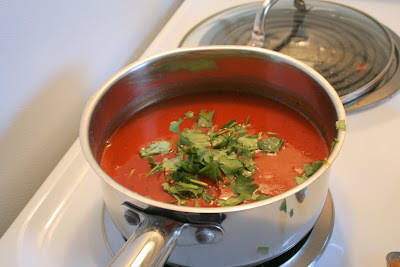 Reduce heat and simmer 30 to 45 minutes. 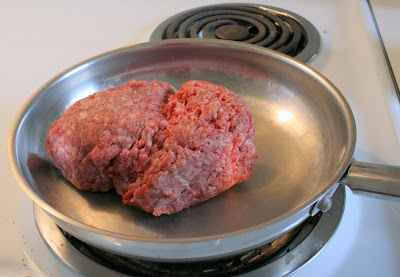 Brown meat with onions in a skillet. 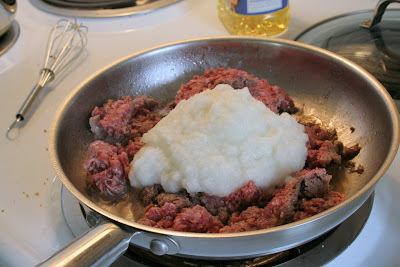 Drain off fat. Stir in 2 cans diced green chilies and seasoned salt. Set aside. 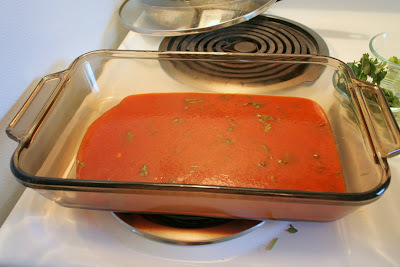 Pour ½ cup red sauce in bottom of baking pan. Spread to even out. 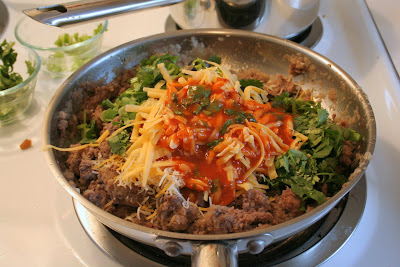 Dip each tortilla into red sauce, then remove to work surface. 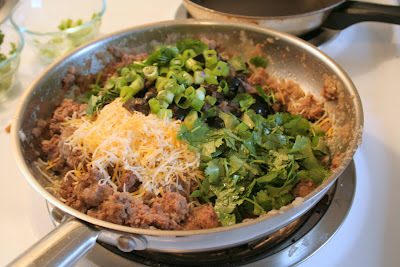 Spoon meat, a little grated cheese, a little black olives, and green onions in the center of tortilla. 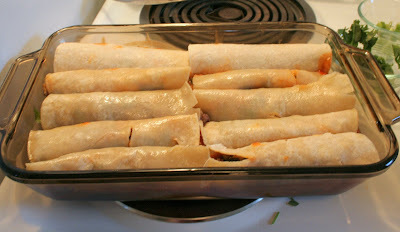 Roll up and place, seam down, in baking pan. Repeat until pan is filled. 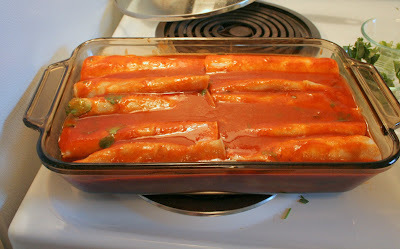 Pour extra red sauce over enchiladas. 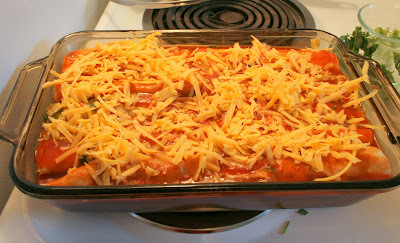 Top with remaining cheddar cheese. 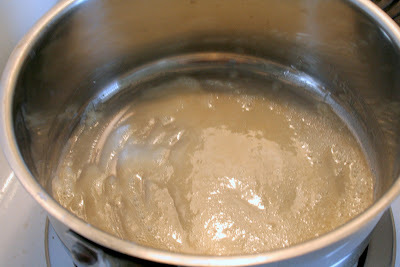 Bake for 20 minutes or until bubble. Sprinkle chopped cilantro over enchiladas before serving. 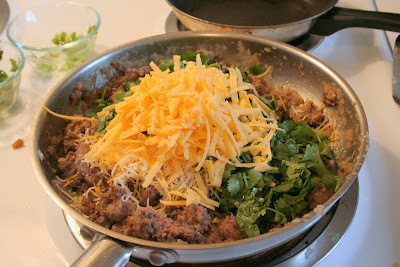 Add your Chopped Onion, and I forgot to buy Green Chiles so I didn't have any of those. 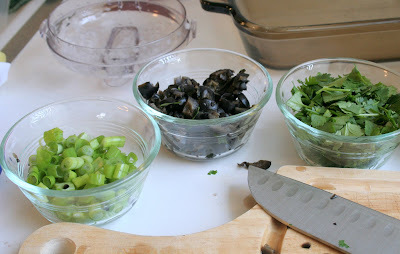 I went ahead and just mixed the Cilantro, Olives, and Green Onions to the Meat. I put some of the Sauce in there too since I knew I didn't have time to dip the Tortillas in the Sauce before filling and rolling. 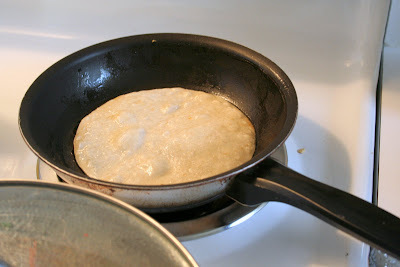 Fill up Tortilla's, roll, and put seam facing down in pan. 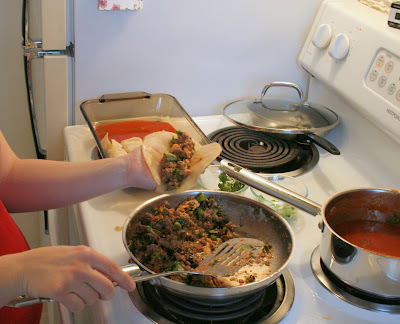 Cary and I both liked this recipe, but we're not big fans of Corn Tortillas and so next time I'll probably use Flour Tortillas.